LAS VEGAS – Las Vegas continues to impress the travel industry and has been named Best U.S. City in Travel Weekly’s 14th annual Readers Choice Awards. Ranging in 78 categories, the awards honor the best of the best in travel. The 2016 Readers Choice Awards were presented in December at a black-tie gala in New York during which many in the travel industry, from hotels to tours to destinations and airlines, were recognized for the quality and value of their products. Finalists were nominated and winners selected in two rounds of voting by readers of Travel Weekly. Travel Weekly and TravelWeekly.com are the most influential B2B news resources for the travel industry. Via a multimedia portfolio of products, Travel Weekly and TravelWeekly.com deliver all the late-breaking news, analysis and research that travel professionals need to succeed. To learn more about the Readers Choice awards, visit www.travelweekly.com/ReadersChoice2016. 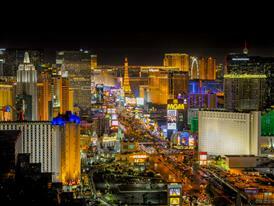 Recognitions like Travel Weekly’s Readers Choice Awards further cement Las Vegas as a world-class travel destination. In 2015, Las Vegas welcomed a record-breaking 42.3 million visitors and is slated to surpass that record once again in 2016.